The elements help me make sense of the world. Air, fire, water, earth—these elemental pieces of nature and of psyche—are embedded in astrology’s language. They act as shorthand for a lot of information. If I know you have mostly earth signs in your chart, I expect you to have different interests and ways of being in the world than if you are mostly fire. Anyone can become a student of the elements, and I really recommend it. Look around and observe. Watch fire, touch the earth. To expand on what the elements reveal about themselves, you might start to notice them in other people as indicated by their charts. Another way, one of my favorites, is to follow the Moon as it transits every sign through a lunar cycle. The Moon’s sign on each day is enormously influential to how we experience that day. The elemental signature of the each New Moon strongly influences my lunar intention for each Moon cycle. The most recent New Moon in the fixed earth sign of Taurus colors my intention this month to seek to “surrender to the earth’s intelligence” (from Rilke’s poem How Surely Gravity’s Law). So, I am following the path of earth this month, noticing what I notice. Without one single earth planet in my own chart, I am particularly interested in learning more about earth’s innate nature. What is it like to surrender to earth’s intelligence? How do I listen to this wisdom? I imagine slowing down to earth’s pace. Earth’s reality (physical reality) fills with the present moment. I only know what my senses are telling me. I stop the internal stories about the past or the future. I am embodied. Meditation brings about a similar state of being—perception without interpretation. This perspective is fresh, like returning to childhood to see everything as new again. Such moments rarely last long. Other elements insert themselves. What I notice next is a natural instinct to tell a story about that moment. A story can move through physical reality like a fire consuming a forest. What does this fire give to the moment; what does it take? Light, heat, energy—I crave the enlivening story that preserves the earth’s intelligence and lives in balance with it. I know I can change my stories. My fire can lie within the bounds of earth. And water, how does this element interact with earth’s reality? Emotion can nourish, erode, or inundate that very same forest. Emotional reality holds the past, my trauma and my resilience. Emotional reality shapes the internal landscape. Respect for emotional realities is essential to bringing this relationship into balance. Air is the medium of exchange. 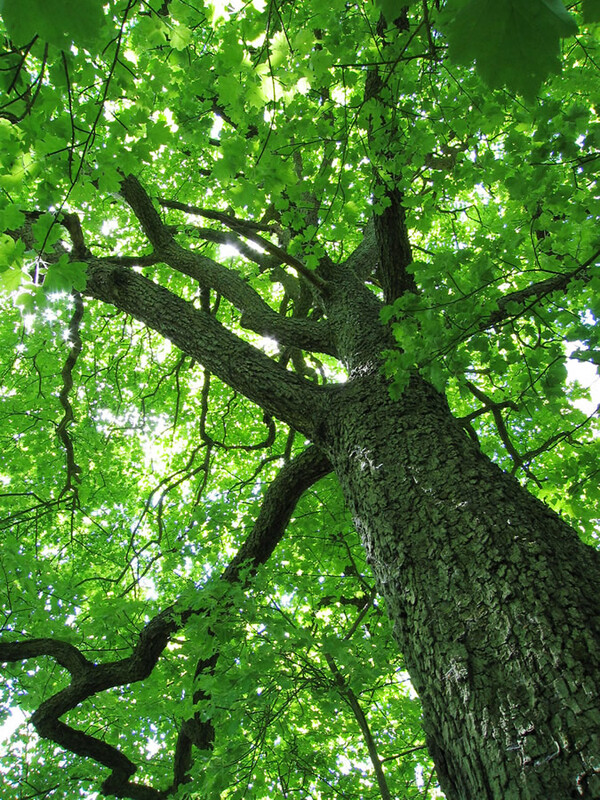 The forest breathes out the oxygen that humans need and humans breathe out the carbon dioxide needed by the forest. Air wants connection, gives perspective, a balanced exchange. Air’s story is about ideas. Ideas shape what we think is possible and therefore has an impact on physical reality. The exchange between an idea and its manifestation is the exchange between air and earth. The Taurus lunar cycle reaches the halfway point this week. 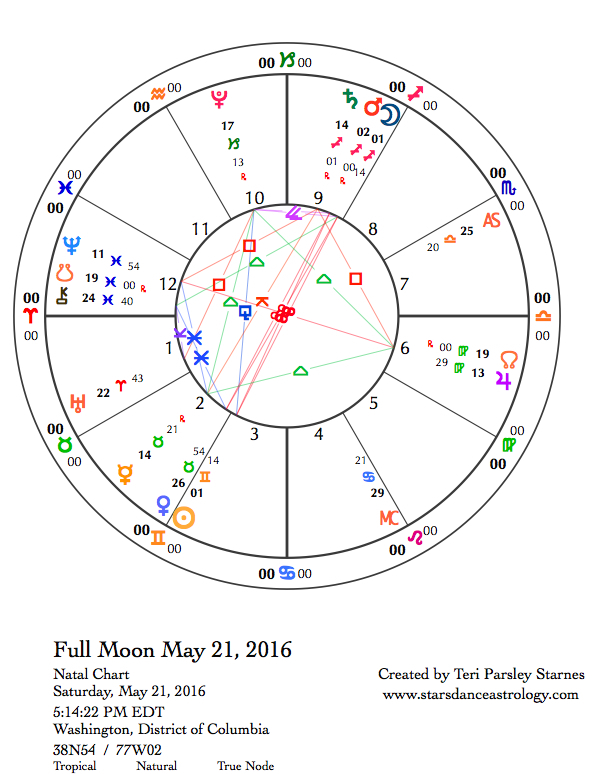 There is a Full Moon in Sagittarius on May 21. Even though the Sun will be in Gemini, illumination is cast upon our Taurus intentions. Sagittarius is a fire sign. What stories are burning through you at this Full Moon? While listening for the earth’s intelligence, do these stories need to be changed? Earth’s wisdom helps us to slow down. If this isn’t part of your inherent nature, as in you don’t have any earth in your chart either, then this is a perfect opportunity to consciously work with fire and earth to create a steadier burn. Monday, May 16. By the end of this week, the Sun will enter Gemini, there will be a Full Moon in Sagittarius, and Mercury will station direct. Today, we get to anchor into the status quo before a bunch of shifting energy is unleashed. The grand earth trine aspect pattern of Mercury in Taurus, Jupiter in Virgo and Pluto in Capricorn is still holding us at least a little steady. The Moon entering balanced and fair Libra will help us with equilibrium. It isn’t as if all the tension of the past few weeks is over, but perhaps we are learning how to cope with it a little better. That is a good hope for the beginning of a work week. May 17—Gibbous Moon: Perfecting. I’ve been riffing on the elements lately. Wondering about the interaction between earth and the other elements. This lunar cycle was seeded with Taurus intention. For me, I committed to surrendering to the earth’s intelligence. This is a feeling of letting gravity do the work for me. Often, I can resist the obvious, how about you? This phase of the Moon can find us feeling a little agitated like there is something else we are supposed to be doing. What if the work is simply to let gravity do its thing? The complement to this earth experience is the influence of an air Moon in Libra. Isn’t air’s perspective a contradiction to feeling earth’s gravity? We might feel this contradiction as stress, but I think all the elements can find their balancing points. Libra also craves harmony and balance. Gravity has its own elegance. We simply are. And as simple beings held by gravity, we breathe into the exchange of ideas and connections. Can gravity help clear our minds? Let’s see. Mercury is still moving retrograde and so there may be a little mental fogginess that could benefit from the exchange between earth’s gravity and air’s perspective. The Moon makes an encouraging connection to Saturn in Sagittarius, which helps with the gravity intention, and later in the day the Moon forms a square to Pluto in Capricorn. What emotional baggage needs releasing? Honor it and let it go. Wednesday, May 18. For a few hours midday (CDT) pressure builds and stress increases. The Moon in Libra opposes Uranus in Aries sparking possible conflict with those who seem diametrically opposed to us. The Moon also makes a brief Yod aspect formation with Venus in Taurus and Chiron in Pisces. A sense of injustice is high. Being extra-sensitive to emotional wounds might fuel a desire to fight rather than seek the peace as is usual for Libra influence. Thursday, May 19. It is nice when conflict can go under the surface where it can be dealt with in private. Or at least that is what a Scorpio Moon might have us thinking. Yes, there are deep resentments and fears that we need to deal with. Do what you can to honor those feelings. Scorpio is the sign opposite Taurus, the sign that seeded this lunar cycle’s intentions. In a couple of days, there will be a Full Moon for real, but the feeling of release may start today. Scorpio gives power to Taurus by asking us to let go. Death experiences can release the power of regeneration. Venus in Taurus makes a sextile aspect to Chiron in Pisces. This favorable connection moves us closer to healing. The key may be to allow ourselves to feel vulnerable and resilient at the same time. Friday, May 20. Sun enters Gemini. We are almost halfway through the Taurus lunar cycle and the Sun just entered Gemini. The remaining part of the lunar cycle may speed up, especially after Mercury turns direct on Sunday. So, take a moment before all that happens to honor earth’s intelligence. We still get to work our Taurus intentions but the energy will shift from gravity to pollination. The Sun in Gemini (mutable air) desires connection and fertilization through the sharing of ideas. The Moon in Scorpio wakes up Mercury in Taurus this morning (CDT) by forming an opposition to the retrograde ruler of Gemini. Will this make Mercury even more of a trickster as the day gets started? Flexibility and adaptability are encouraged. 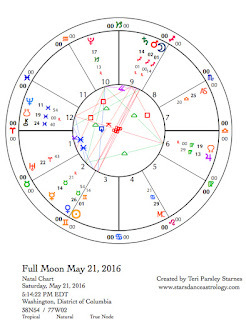 May 21—Full Moon: Illuminating. This Full Moon highlights two major influences of this lunar cycle: the Mars and Mercury retrogrades we are currently experiencing. Mars in Sagittarius is conjunct the Moon and Mercury is stationary today, readying to turn direct tomorrow. This is a perfect opportunity to reflect on the stressors of the last two weeks. Mars retrograde may have impacted your energy, turned your anger inward, or just felt like a bigger weight, making it harder to move forward. I believe that it is Mars’ final destination that increases this sense of gravity—the realm of Scorpio. Mars will reenter this sign on May 27. Soul work is ahead. Perhaps we need to dig a little deeper. Mercury has been retrograding through Taurus. This sign likes clear-cut and direct communication. Perhaps this desire for clarity has been challenged by this retrograde. Certainly the direct transit of Mercury across the face of the Sun seems to have intensified the effect of Mercury retrograde frustration. And now we have a Full Moon triggering any unresolved agitation. Now is the perfect time to call upon the things you have learned from the earth this lunar cycle. What does the earth tell you about stress? What does your body want to tell you about the earth? Earth’s intelligence feels essential to our survival. Daily news of species extinctions, industrial disasters, pollution, and climate change creates an onslaught of grief for those who long to surrender to the earth’s wisdom. Neptune in Pisces opposing Jupiter and squaring Saturn in Sagittarius could be telling us to let ourselves feel the grief of loss. It is big and we need to give this loss the gravity of our awareness. Recently a friend shared this article by psychologist Per Espen Stoknes about needing to grieve these earth losses before we can do anything about them. Both the pain and the solution to the pain seem to reside in the same place: in the earth’s intelligence. Sunday, May 22. Just because the Full Moon was actually yesterday, it doesn’t mean we don’t feel all the feelings today. We do. Mercury stations direct in Taurus. This is probably a relief. Certainly, life will speed up. The other retrograde—Mars—that is having a big impact right now directly opposes the Sun. This is the heart of a Mars retrograde, when it reaches the opposite point from the Sun. Like a Full Moon, something is illuminated about this Mars journey. What are you noticing about anger, passion, energy and drive? It is about to get more soulful when Mars moves back into Scorpio. The Moon activates the t-square of Jupiter in Virgo opposite Neptune in Pisces and square Saturn in Sagittarius. We are trying hard to understand and convince others of our understandings. Stakes feel high and clarity is low. What values guide you through the complexity?